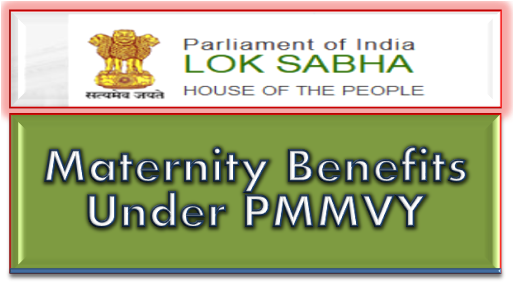 The maternity benefits under Pradhan Mantri Matru Vandana Yojana (PMMVY) are available to all Pregnant Women & Lactating Mothers (PW&LM) except those in regular employment with the Central Government or State Government or Public Sector Undertaking or those who are in receipt of similar benefits under any law for the time being in force, for first living child of the family as normally, the first pregnancy of a woman exposes her to new kind of challenges and stress factors. The objectives of the scheme are: (i) providing partial compensation for the wage loss in terms of cash incentives so that the woman can take adequate rest before and after delivery of the first living child; and (ii) the cash incentives provided would lead to improved health seeking behaviour amongst the Pregnant Women and Lactating Mothers (PW&LM). However, to address the problem of malnutrition and morbidity among children, the Anganwadi Services Scheme, which is universal, is available to all PW&LM including the second pregnancy. Further, in order to address the malnutrition and morbidity during pregnancies a number of interventions are provided to the pregnant women viz. universal screening of pregnant women for Anaemia and Iron and Folic Acid (IFA) supplementation, Calcium supplementation in pregnancy, Deworming in pregnancy, Weight gain monitoring and Counselling on nutrition, family planning and prevention of diseases. The Government of India has approved Pan-India implementation of PMMVY in all districts of the country w.e.f. 01.01.2017 under which the eligible beneficiaries gets Rs. 5,000/- under PMMVY and the remaining cash incentive As per approved norms towards Maternity Benefit under Janani Suraksha Yojana (JSY) after institutional delivery so that on an average, a woman gets Rs. 6000/-.